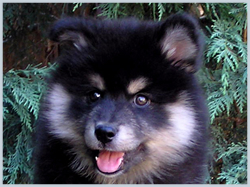 The Finnish Lapphund is a medium sized, compact dog, strong when compared to its size and sturdy to look at. 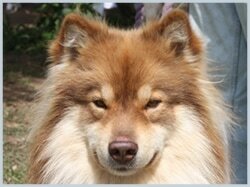 They are a very striking and attractive breed. 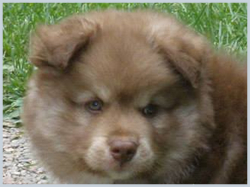 They have a broad and relatively short head, with a smiling, soft and humble expression, and a distinct stop. 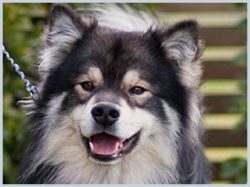 The expression of the Finnish Lapphund is very important. 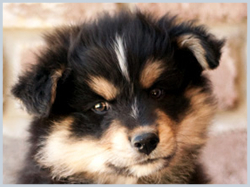 They have small, broad based ears, which are almost always pricked, but may be tipped or odd with one tipped and one pricked, but shouldn't be dropped. 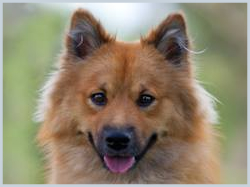 Eyes are dark brown but harmonises with the coat colour (which means, for eg, a brown dog will generally have a slightly paler eye colour). 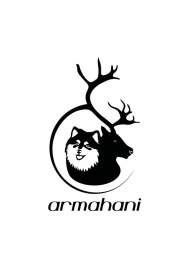 They have a thick, harsh double coat. The outer guard coat is long and coarse, and the undercoat soft and dense. Males in particular have an abundant mane or ruff. 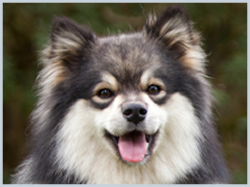 A particular feature of the Finnish Lapphund is the difference between the appearance of the males and females. 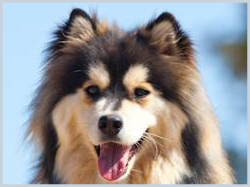 At first glance you should usually be able to tell whether a Lapphund is male or female, with the boys looking masculine and the girls feminine. The males also have a bigger coat, particularly around the ruff. And although there is a cross-over in acceptable sizes (males ranging from 46cm to 52cm with 49cm being the ideal, and females ranging from 41 cm to 47cm with 44cm being the ideal), the females are generally noticeably smaller. 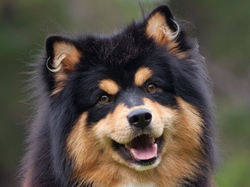 For the main the Finnish Lapphund is a slow maturing breed. 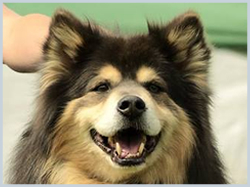 In Finland, it is not uncommon for those entered in the Veteran class to take out top-honours in breed judging, and peak time is often 4 to 5 years of age. 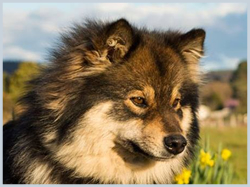 Coming into adolescence it is normal for a Finnish Lapphund to go through quite an ugly patch - leggy, out of proportion, with hardly any coat. 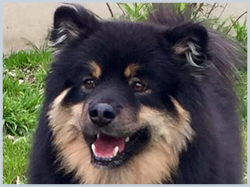 As a general rule, if the puppy was beautifully put-together, this adolescence is merely a glitch and a by about 18 months to 2 years you should be able to see the beautiful Lapphund emerging from the cocoon. 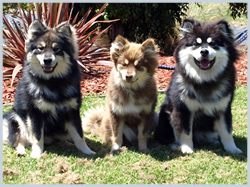 One of the striking features of the breed is the range of coat colours and markings. Although this can also be its challenge, particularly when people are attracted to a rarer colour and discover getting such a pup is not all that easy. Colour terms can be used interchangeably, which regularly adds to confusion. 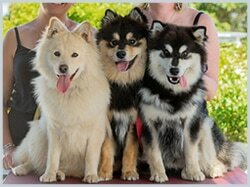 ​Photos (of the same dog as a pup and adult) and explanations of some of these colours and patterns can be found below. I'm still collecting photos so please bear with us while this page is a work in progress. 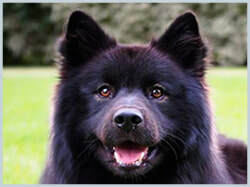 While some of these photos are of my own breeding, many aren't so I would like to than those owners who have let me use photos to illustrate the huge variety in our breed. 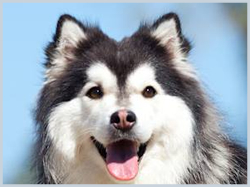 Often referred to as "black and tan" or sometimes "black and cream" for those Lappies with a paler "point", both shade and amount of markings can vary dramatically across individuals. This is the most common colour and pattern seen in Lappies and what most would be familiar with. 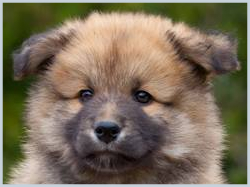 Puppies are usually born with minimum markings (although you can get some with strong markings at birth), which gradually emerge as they become an adult. 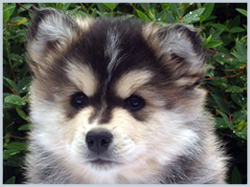 It can be difficult to predict in a pup the level of markings they will develop as an adult. 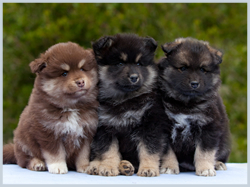 Like their black counterparts, these are usually referred to as "brown and tan". 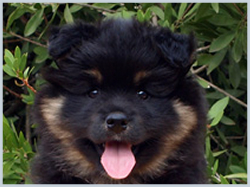 Similarly the shading of their markings, and their amount, can vary quite considerably. There is also a large variation in the brown shading, with some tending more toward "orange" and some a deeper chocolate. Dominant to the tanpoint marking, the wolfsable (often referred to as agouti in other breeds) consists of variations of black and brown or cream along each hair shaft which gives a grey "wolf like" appearance. 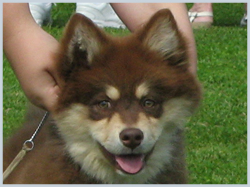 Shade can vary so that some appear almost black with only a little bit of shading around the head indicating the true pattern, and some a pale silver like colour. Some have points, consisting of the tranditional facial pattern and paler coloured legs (again ranging from a pale cream to a deep copper), similar to the tanpoints. Whereas others are quite dark in the face with very little marking. 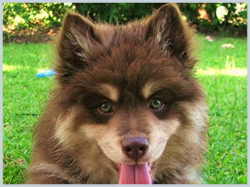 The brown equivalent to the wolf sable is generally usually referred to as "brown wolf sable". Many of these can be difficult to distingiush as adults from the brown tanpoint lappies. 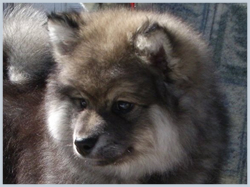 The almost "mottled" like look to their colouring, with the different shading along the hair shaft, can generally be seen about the head, but it often more apparent in the puppies. Because "sable" can be used interchangeably as a term, to refer to any Lappie with mutliple colours in the hair shaft (such as wolf sable and domino), the word is often confused. To make it even more confusing, as adults these Lappies can often be mistaken for creams. 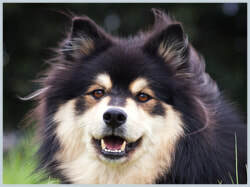 True sable (referred to as soopeli in Finland) is dominant to both tanpoint and wolfsable, and can be thought of as the same colour as a sable Collie (although usually without the white points and collar of a Collie). 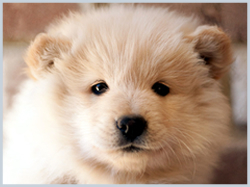 Born with a great deal of black tips to the hairshaft (which means the pups are clearly distinguishable from cream), this gradually fades as the puppy grows, so that they become an all over cream or golden colour, with usually only small amounts of black tips - often around the tail and ruff. They are on average a deeper colour than a cream, although this is not an unbreakable rule as I've seen almost white coloured sables, and quite golden coloured creams. 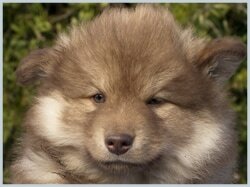 Unlike the creams, however, they almost always retain their nose pigment, which can be a distinguishing freature. 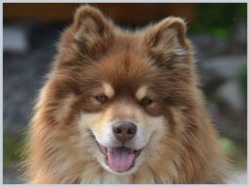 Referred to as a brown sable, this pattern is the same as the sable, but with brown factoring, or a brown base. Rather than black tips to the hair shaft, these will be brown. Given these fade off in most adults, that can mean it can be difficult to tell a black factored sable from a brown factored sable. The obvious difference wil be pigment at the nose, lips, eye rims and feet pades. This pigment will be brown rather than black. 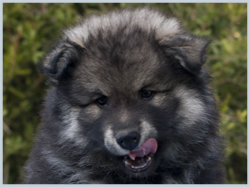 Generally we assume in Lappies that solid colouring is what we often called "recessive black", the gene for this "pattern" being recessive to sable, wolf sable and tanpoint. There may also be some who are "dominant black" caused be another gene entirely. But for the majority I have seen, the inheritance would appear to be the former. 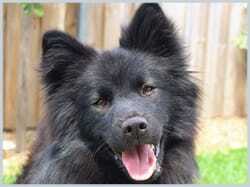 These dogs have no markings about the face or legs at all, being black all over. 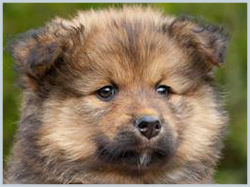 Sometimes particularly dark faced tanpoint dogs can be confused with these, particularly as pups before their colouring has come through entirely, but they will usually have paler coloured legs, whereas the solid coloured ones do not. 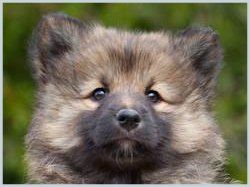 Interestingly enough, while very dark and solid in colour as pups, many of these will form "spectacles" around the eyes and silver shading through the coat. The genetics of this is a little bit of a mystery. Solid browns are the equivalent of the solid black. Like the brown in the other coat patterns, shade of brown can vary significantly to a fairly light colour to a deep chocolate. 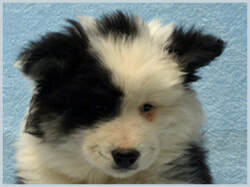 Domino is our mystery pattern! 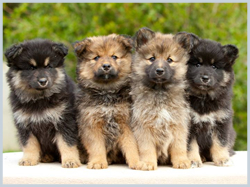 Despite the genetic factors having been identified in other breeds who share a similar pattern, these have not been identified in our breed. Theories abound, and it is highly likely that the gene which produces cream plays a part in domino showing in the phenotype. 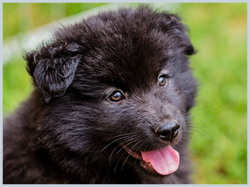 But it can be rather difficult for breeders to predict for sure whether they will see domino in their litters, and it is also generally rare. Which can be frustrating for the future pet owners who are drawn to this pattern. 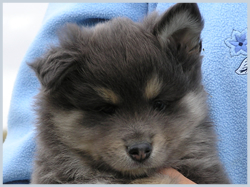 Unlike black tanpoint pups, who are mostly born dark with markings emerging as they age (although some can have relatively strong markings at birth), or wolf sable pups where the "sabling" in the coat also emerges as they age, domino pups are born with full and very striking masks, always with very large "eyebrows" and often with a white stripe on the head which fades, and usually a "mottled/sabled" like appearance at birth. This can vary in colour from silver grey, to shading of copper throughout the coat. Brown dominos are very rare, given the interplay of genes involved. I only know of a couple ever born in Australia, and we have tended toward a fair amount of domino in our lines compared with the other English speaking countries. 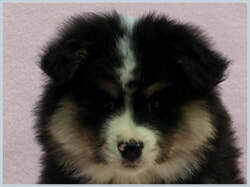 They are generally paler than brown tanpoints, and like the black factored domino are born with the full mask including extra large "eyebrows". 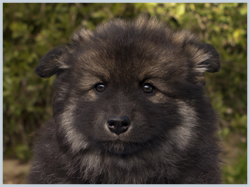 Sometimes a brown tanpoint pup may be born with clearer than normal markings, but to those experienced in the colour variation the difference is obvious. 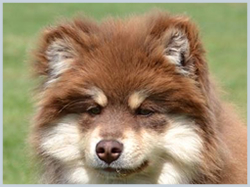 Like all brown dogs, brown dominos carry no black pigment at all, so shouldn't be confused with a black factored domino who just happens to have a lot of copper or brown colouring within the hair shaft. Cream hides all other colours and patterns (except for white markings or Irish spotting - see below). 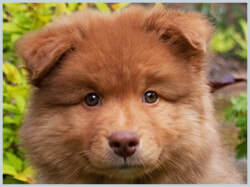 It is a recessive colour which removes all eumelanin, leaving only phaeomelanin pigment as part of the dog's phenotype. 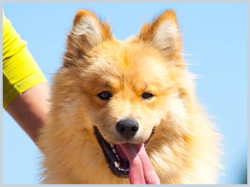 For this reason we often talk about cream "covering" what the dog is genetically underneath. 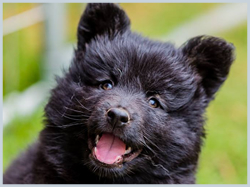 A black factored cream Lappie might be a black tanpoint, or a wolf sable or a solid black (or even a blue) in its genotype (which will dictate what genes it can pass onto progeny), but will appear as cream. The cream can vary from practically white looking, to a deeper apricot colour. 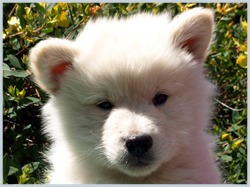 Cream Lappies almost always have a faded snow nose as adults, even those who have strong black pigment as pups. 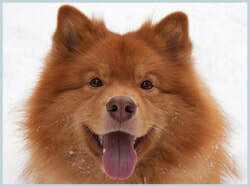 Because of the faded noses in cream Lappies, brown factored creams can't always be easily distinguishable, but will always have brown pigment in those areas where you would expect to see black (nose, lips, paw pads, eye rims for example). However it can sometimes be difficult to tell the difference between a brown factored cream or a black factored cream with just poor pigment. Personally I have never had a brown factored cream born in any of my litters, and I'm not 100% sure I would always be able to tell the difference. 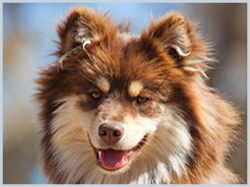 Like the black version, a brown factored cream could be a brown tanpoint, a brown wolf sable or a solid brown (or even a lilac theoretically although that would be an incredibly rare genetic combination) underneath. 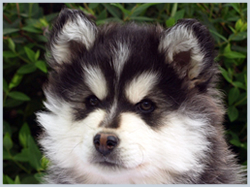 Dilute is a recessive gene which fades or "dilutes" the pigment of dogs, creating a silver look in an otherwise black dog. We refer to these as "blue". While fairly rare in Lappies, there has been some dilute in the gene pool in Australia, so it has shown up in litters a few times. 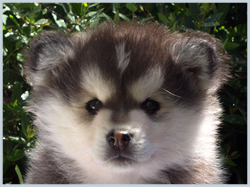 Pups are born quite pale silver looking, but gradually darken so as adults they are not hugely different from the non-dilutes, they tend to just have a slightly dull or faded off look to their coat. This also affects pigment on noses, lips, etc. 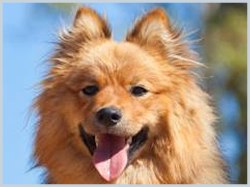 The dilute gene can be associated with some skin problems in short coated breeds, but the long coated gene prevents this, so that there is no health issue associated with dilute in Lappies. 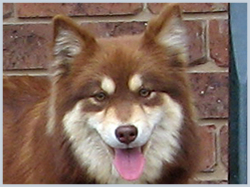 Dilute can theoretically apply to a wolf sable or solid coloured Lappie as well as a tanpoint one, but given its rarity it is most commonly seen with the tanpoint pattern. 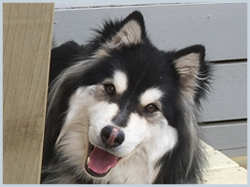 Lilac is the same dilute gene as blue, but impacting on a genetically brown dog rather than a black dog. It is a hard colour to describe but comes across as a pale silvery fawn colour. 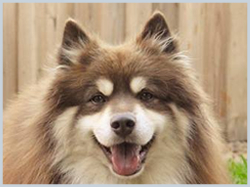 Because of the interplay of two recessive genes (one of which is rare in of itself) required for it to be the phenotype of a dog, it is incredibly rare, and very few Lappie enthusiasts would ever see one in their lifetime. White markings on a Lappie are not that uncommon. 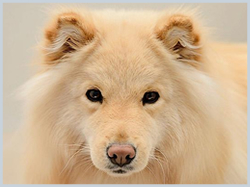 This is caused by the same gene which results in the white on other working breeds such as Border Collies, Collies, Shetland Sheepdogs, Corgis, etc. There is a genetic influence which dictates when this gene is "triggered" in embryonic development. 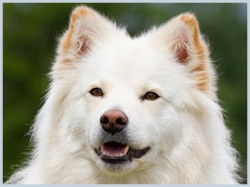 The earlier it is triggered the more white will be seen across the collar or ruff of a dog, even onto the shoulder, and on the face. 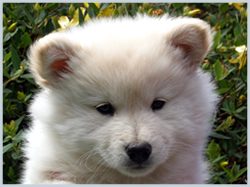 In Lappies, for the main part, it is triggered late in development, so generally you will see most with just a white chest, maybe a white paw or tail tip, and occasionally a white splash on the head. 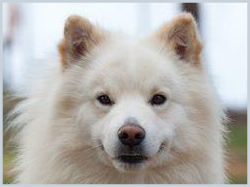 In some bloodlines, however, there is typically a much earlier "triggering" of the gene, and in that case you can have Lappies with big white collars, and splashes of white across their face. This is perfectly acceptable. It can apply to a black, brown, or even a cream Lappie (although can often be difficult to spot on a cream). On a tanpoint, the colouring can sometimes be referred to as "tri-colour" although this is not a typical Lappie term. On a solid coloured Lappie you will often hear "black and white" referred to. A solid white Lappie, with very small patches of black or brown, is considered incorrect.